ICT Solutions aims to put the best practices into place to stop cyber attacks from occuring, which is why we’re thrilled to have completed the Cyber Essentials Certificate. Cyber Essentials accesses the systems, security and policies that we have in place to protect against cyber hackers. 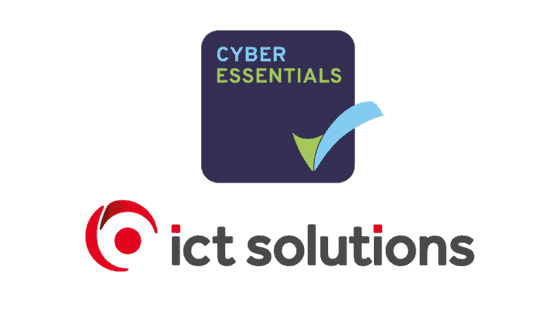 The Cyber Essentials Certificate shows our commitment to cyber security, giving you even more reason to trust ICT Solutions to combat cyber security threats towards your business. Cyber Essentials is a scheme that is backed by the government to protect organisations against cyber attacks. Not only will Cyber Essentials help our company fight cyber attacks, it will also be beneficial to our customers. Cyber Essentials focuses primarily on small, common cyber attacks that are carried out by unskilled hackers. Although they may be small attacks, if left unnoticed they can become a huge problem and single you out as a vulnerable target. Having a Cyber Essentials Certificate gives peace of mind that those small, unnoticeable cyber attacks are prevented and dealt with. The size of your business doesn’t matter when it comes to cyber attacks, so whether you have a small business or a large business, you’re a target for common cyber attacks. For smaller businesses, however, these common cyber attacks can be catastrophic without the right security protection in place, which reinforces the need for proper and reliable small business IT support. ICT Solutions take cyber security very seriously which is why we’ve obtained certification that reassures and protects ourselves and our customers. We have a clear understanding of our security level and have all the policies and practices in place to protect large or small IT infrastructure. Cyber Essentials has updated our ability to protect our own and our customers’ IT systems from common cyber attacks and we have a range of IT services to manage your security. Get in touch with our cyber security experts today to find out more about how we could help protect your business from cyber attacks. Call us on 0151 230 2424.